Are there any Dr. Who fans out there? Which doctor is your favorite? Is it 1? 10? No need to time travel to find these patterns, just look below for fun Dr. Who themed patterns from around the internet. The doctor can't go anywhere without his Tardis. It is a part of him and if you notice, it changes for each doctor. It goes without saying that the Tardis is always bigger on the inside. This pattern by GeekChicStitchery has little gems throughout the pattern. We see the Tardis, but if you look closely, the trinkets from past Doctors pop out at you. 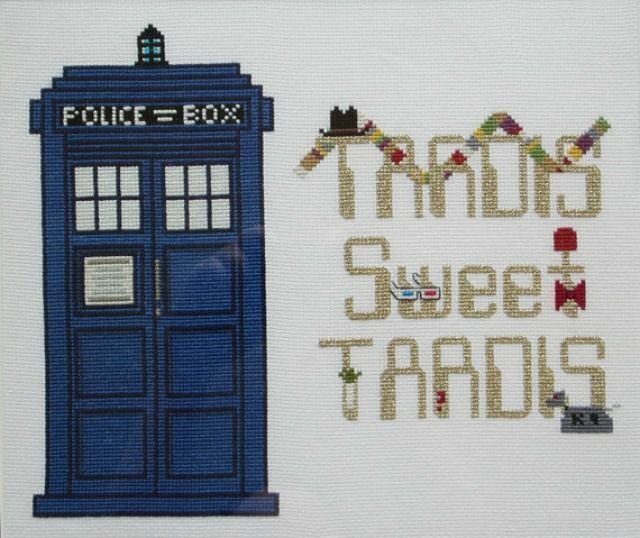 You can also stitch up a Tardis Sweet Tardis for a friend who just bought a new house. Every doctor must have a companion; otherwise, he loses his humanity. Fans have their favorite companion and as well as ones that we were glad to see stay at home. Wee Little Stitches created this companion piece to go with their other Dr.Who patterns. The pattern features Rose, Martha, Donna, Rory, Amy and River Song. You can stitch this up as one piece or pair the companion with the doctor. They also have the doctor's villains and allies in cross stitch form. You could create your own little Dr. Who world with these patterns. Weeping Angels, Daleks, and Cybermen are just a few of the villains that the doctors have encountered. It is hard to decide which ones are the most evil but most people will tell you that the Weeping Angels are the scariest! Others will tell you that is is the Daleks that keep them up at night and still some will throw you for a loop and tell you that humans are the worst. The Fair Isle Dr. Who pattern is free on Ravelry created by Amy Schilling, This is a knitting pattern but it will also make a would make an awesome sampler. If you are very ambitious, you can use waste fabric and stitch it onto a sweater or hoodie. We have seen a pattern for every element of the Dr. Who series, now we just need the doctor. Just like villains and companions, everyone has a favorite doctor. Geeky Stitches has created a pattern that includes all the doctors from the very beginning up to the current one. Not only does she have all the doctors in one pattern, she has created individual doctor patterns with quotes.